When I’m working on this series, I always envision a big cookie tray. And I think, what else can I put on this tray to give it a new color/texture? Because let’s face it — a tray full of round pepperminty-type cookies might be delicious, but it would be boring. In order to give some variety to the shape/texture of my imaginary “tray” (What? You don’t have an imaginary cookie tray in your mind?) 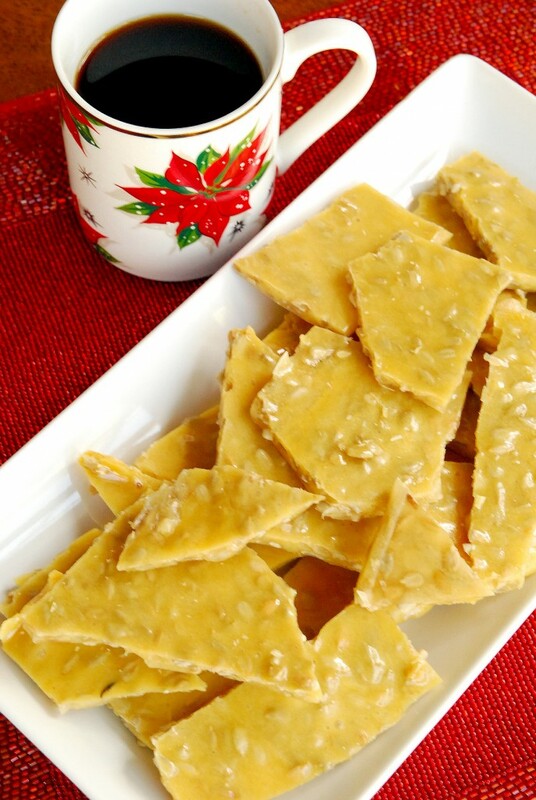 I love to include a good brittle. It’s crunchy. Golden. Abstractly shaped. All this things I’m looking for. But peanut brittle is so expected, so I changed it up a bit. Since I’m a Kansas girl and we are the Sunflower State, I used sunflower seeds! 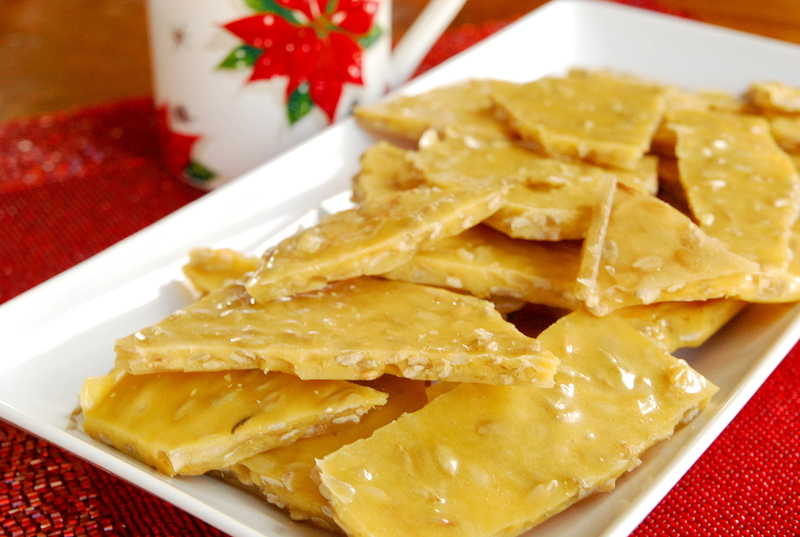 Their salty texture is a perfect foil to the caramelized brittle. And the best part about this is you get to be totally imperfect and break it up however you want. The crazier the shape, the better. Yay for being imperfect during the holidays! Depending on the size of your jelly roll pan, this may or may not cover the whole thing. No worries. You break it apart anyway. Bring water to a boil in a medium saucepan over medium-high heat. Stir in sugar and corn syrup until dissolved. Stir mixture constantly until candy thermometer reads 260 degrees. Add sunflower seeds and continue stirring until candy thermometer reaches 295 degrees. Remove from heat, and stir in butter, vanilla and baking soda. Quickly pour onto a well-buttered jelly roll pan. Let cool and break into pieces.